The Messerschmitt Bf-109T, or Toni, was originally designed to be flown from the German aircraft carrier Graf Zeppelin. 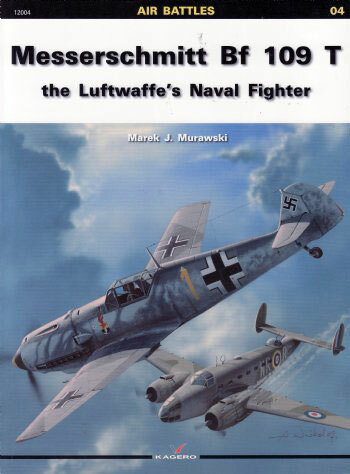 With the cancellation of the carrier the fighters, which were essentially long winged Bf-109E-4s, were allocated to various units and fought on until the end of the war. This book follows both the carrier and the 109 from conception until the end. This soft bound book contains numerous black and white photos and ten full color plates. The pictures are large and very clear, perfect for the modeler who wants to make a Toni. The text is on 50 pages and is easy to read. Included are several personal accounts which adds to the story of this particular machine. There are a few previously unpublished photos included and these are a welcomed addition. Also included in the color plates is a fold out section with two large aircraft profiles, one being the flame nosed aircraft of Oblt. Christmann. I noted that this particular profile did not have the 4th Gruppe symbol or the yellow tail band but it is still quite colorful. A nice addition is the inclusion of canopy masks for the 1/48th Tamiya and the ICM 1/72nd Bf-109E4/7. They will simplify the task that I hate the most about modeling. The interesting text, great photos, good color profiles, and excellent drawings, not to mention the masks, makes this book an outstanding value. Review Copyright © 2008 by Floyd S. Werner Jr.